Bernhead Trümpi – Climbing a wall. Bertha Barbara Trümpi’s marriage record is the one place the clearly describes her father’s name, Bernhead. Some other records indicated that his name might be Bernard or Benard. Family oral history indicates that he was a musician working at a local hotel in Glarus or Ennenda Switzerland. We know that he was married twice, once to Bertha’s mother and again to a woman who was Bertha’s stepmother, whom Bertha didn’t like. Bertha’s marriage record also indicates that her mother was “Bertha Koch.” Other records indicate that “Bertha Trümpi” came to the United States to visit her daughter Bertha Barbara Huber. Additionally, that second Bertha located to California and is thus believed to be her stepmother. Sound confusing? It is. Searching more for Bernhead Trümpi in the on-line records hasn’t resulted in anything. Several scenarios come to mind. It could it be that Bernhead married an unknown woman who gave birth to Bertha and then that woman either died or was divorced. It could be that Bertha Koch was Bertha’s natural mother. It could be that Bertha Koch was Bertha’s stepmother. It could be that Bernhead married two different women both named Bertha. First, I should follow what happened to each of Bertha’s siblings. Possibly, there will be something in their lives that can point to his or her father’s life and untangle the mother, stepmother tangle. Second, I’ll investigate of all individuals with the surname Trümpi from Ennenda, Switzerland, and see if anything illuminating comes from that. Third, use a FAN (Friends, Acquaintances, and Neighbors) Analysis and see if I can determine more of Bernhead’s life from their lives. Fourth, I’ll hire a genealogist in Switzerland who specializes in the Ennenda, Glarus, Switzerland area. Finally, I’d love to take a trip to Switzerland. A couple days in Glarus would be awesome. I could research and my wife would see the sights. Ernst Lorrain Trümpi is Bertha’s youngest sibling. He was born 22 October 1905 at sea on the trip to the United States aboard the SS La Lorraine to Bertha Trümpi. Again, I’m not sure if it was Bertha’s mother or stepmother. The ship arrived in New York on 28 October 1905. 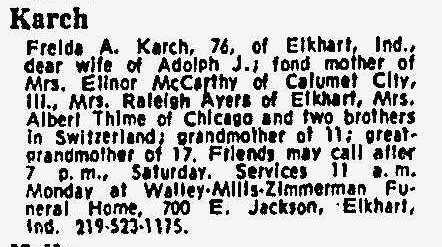 Luckily, the 1940 Census shows him living with his sister Freida and his brother-in-law, Adolph Karch. When Ernst Lorrain Trümpi became naturalized, he changed his name to Ernest Lorrain Trumpy. Ernest died 05 Nov 1967 in Elkhart, Indiana. That 1940 Census record provided the married name for his sister Freida. They appear to have had four children. The 1940 Census also indicates that Adolph had a granddaughter living with them named Marcella Whitmore. It isn’t clear if Marcella is one of the above three daughter’s child or if she is the daughter of another unknown Karch daughter. Freida’s obituary indicates that she had two brothers living in Switzerland at the time of her death. These must be August and Fredrick. She arrived with Bertha and Ernst in 1905. “Daughter Bertha Trumpi of New Glarus” in 1905. Certainly, many questions need answering. Why would Bertha Trümpi (the elder) leave Switzerland pregnant with three children and never return. Had Bernhead died or had they divorced? If one of the siblings still in Switzerland when Freida died was Fredrick, whey did he return, is or there another sibling that is unknown. Research the siblings of direct ancestors. Research the children of those siblings. If viable, research similar surnames from same location. Research friends, acquaintances, and neighbors (FAN). Hire a genealogist with specialization in the time and place of interest. If possible, personally research in the specific place. Of course, anywhere along the way where I encounter another researcher researching the same people, I reach out to them and see if they may have additional resources or insight into the family. Author Don TaylorPosted on November 17, 2015 March 16, 2017 Categories DarlingTags Huber, Karch, Koch, Switzerland, Trumpi, Trumpi: Bernard, Trumpi: Bertha Barbara, TrumpyLeave a comment on Bernhead Trümpi – Climbing a wall.